Place pieces of sliced streaky pork on the bottom of the pot followed with coriander roots, garlic, ginger, spring onion and Pine Brand vermicelli over them. 3. 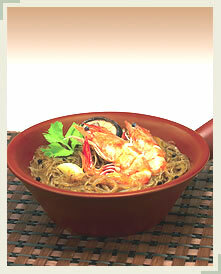 Pour the soup broth with ingredients into the pot and stir in Pine brand vermicelli to mix thoroughly. Place fresh shrimps over and close the pot’s cover. 4. Braise it for 5 minutes, add coriander or celery and ready to serve.